Halloween Memories + McDonalds Giveaway! You are here: Home / Entertainment / Giveaways / Halloween Memories + McDonalds Giveaway! Halloween was always something to look forward to as a child. 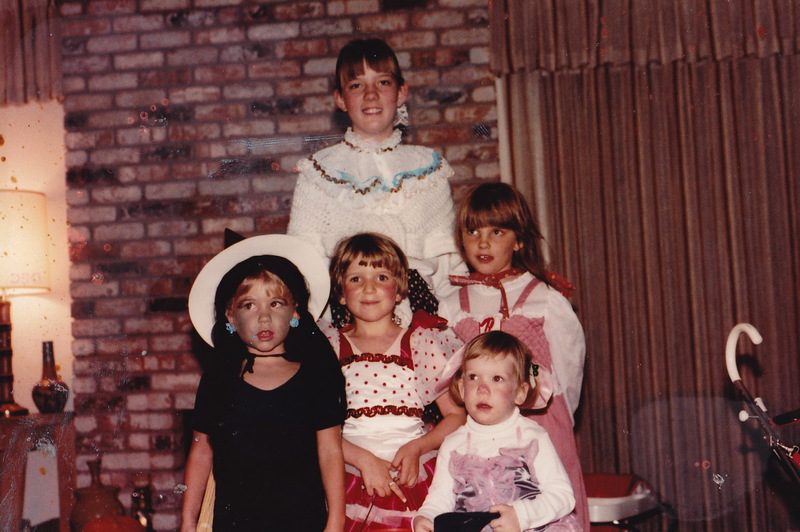 I loved dressing up (I seem to remember almost always dressing up in one of my ballet costumes) and then going from house to house for HOURS gathering all the candy I could. I’ve always had a sweet tooth. That’s me in the middle, in the red and white “School girl” ballet costume that I vividly remember picking out for one of my concerts. Unlike most ballet costumes, that particular dance allowed each person to have a unique costume, and I loved it. My little sister wore my old mouse costume, and a few of our neighbor friends joined us for trick or treating. Now that I am a mom, I enjoy Halloween almost as much as I did when I was a kid. I mean, I don’t have to dress up if I don’t want to, and all I have to do to get a stash of candy is walk my kids around the neighborhood while they fill up their buckets. I am an active participant in the post-trick-or-treating candy exchange and bartering. Thank goodness my kids have not developed tastes for a few of my favorite treats. And with three kids in elementary school, I can crash three separate Halloween parties and sample from the best goodies in each room. Candy aside, Halloween is a happy time. It’s a time of tradition, a time to enjoy youth and break a few rules, a time to spend together with my kids. Did you know about McDonalds’ “Make Family Time Happy Time” campaign? On McDonalds’ Facebook page, or right here on this widget, you can pledge your time together as a family, and McDonalds will turn those minutes into donations for Ronald McDonald House Charities (up to $10,000). McDonalds wants you to pledge 60 minutes of family game time, or 30 minutes of time reading together. Maybe you could pledge 90 minutes of cooking together with your child or 45 minutes of raking a neighbor’s leaves with your kids. The great thing about this campaign is that everyone benefits. You and your kids get to pledge your time together, and those people who take advantage of Ronald McDonald House Charities will benefit, too. In conjunction with the “Make Family Time Happy Time” campaign, McDonalds has offered five of my readers their classic Happy Meal trick or treat pails. Each pail comes with stickers to decorate Mr and Mrs Potato Head, a removable handle that can be used as a mask, and a coupon for free McDonald’s Apple Dippers, too. When we received our pails the other day, my kids went to town decorating the Potato heads with the fun stickers. 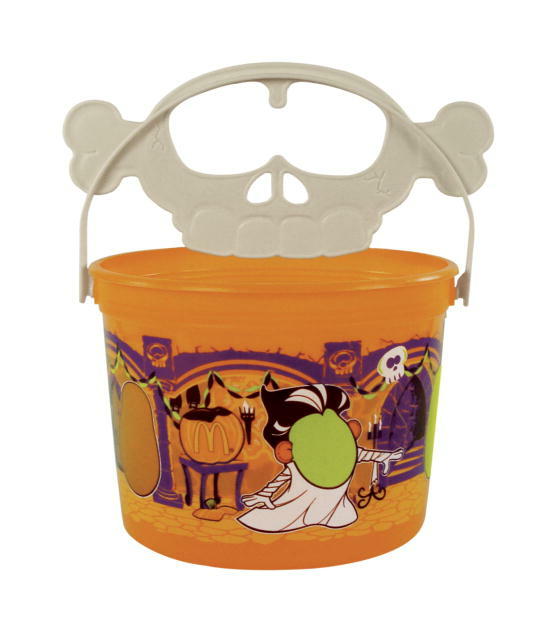 And I was transported back in time when I, too, had McDonalds Happy Meal pails for trick or treating. Talk about nostalgia. 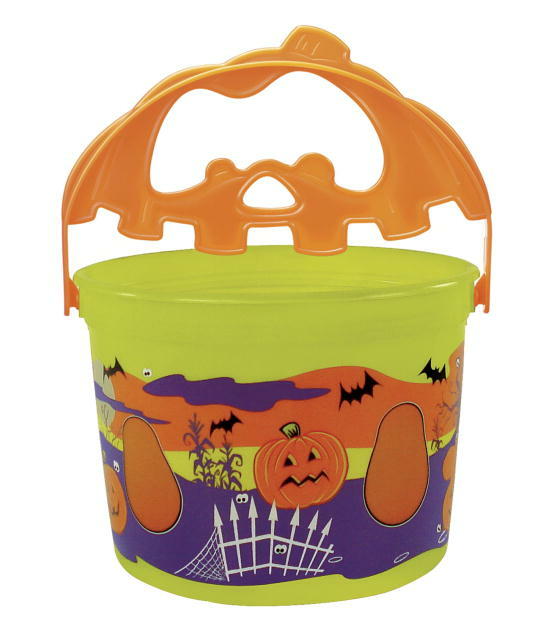 To enter to win your own pail and apple dipper coupon, tell me about a favorite Halloween memory or tradition. Pledge your family’s time on the “Make Family Time Happy Time” widget. Follow Better in Bulk on Google Friends Connect (sidebar), Facebook, Twitter, or through RSS. If you already are, that counts, too. Vote in the Avocado Big Hit contest. Just to clarify, I cannot ask you to vote for me (Laura) as part of a contest, but I can encourage you to vote for your favorite recipe! Because Halloween is a little over a week away, this contest will be short and sweet. Entries will be accepted through Tuesday, October 26 at midnight Eastern time, and five winners will be announced on Wednesday. Be looking for an email from me! And good luck! Disclosure: I received five Happy Meal pails for my kids, but wrote this post out of love for this campaign, family togetherness time, and the importance of making memories with our kids. what a cute old photo. halloween is one of my absolute favorite holidays. but, my hubby isn’t as big of a fan as i am, so it has gotten to be a bit more low key. i love the cooler temperatures and desire to have nice hot chili (homemade, not from a can – we do that the rest of the year). I also love getting the house decorated for fall with a cute halloween accent. I never had a chance to celebrate Halloween as a kid, because it was completely unknown in our coutry at that time. The more I like this holiday now – it’s so fun! I remember dressing up as a kid and eating candy. My favorite Halloween memory is my mom making me an awesome homemade Crayola Crayon costume…it was adorable! Thanks for the chance.